Otago's Richard Edwards wants to close the "loophole" allowing duty-free import of tobacco and costing the country millions in lost excise revenue. Let's look at this from first principles. First, recall that excise is imposed not for the purpose of revenue generation, but rather (ideally) as a quasi-Pigovean charge to internalise external costs of consumption, noting however that current tobacco excise is roughly three times any cost smokers impose on the government through the public health system. "Lost revenue" matters a lot less than whether we've messed up relative prices. Visitors to New Zealand bringing tobacco or alcohol products with them for their own consumption while here should not be subject to excise taxation on those imports where excise is intended to defray the costs to the public health system involved with the consumption of those products. Tourists will go home and eventually potentially impose costs on their own public health systems for tobacco consumed while here, but are not likely to impose costs in New Zealand. Alcohol could potentially lead to the imposition of social cost if someone flies here, gets drunk, and does silly things. We then need a balancing between the expected social cost per unit import and the cost of collecting duties and tariffs at point of import. Excise on spirits is $50 per litre of pure alcohol; the duty-free concession is three bottles of spirits that would likely contain about 1.35 litres of pure alcohol, or $67.50 in tariff. A very small portion of that would represent potential expected costs that could be imposed on the New Zealand government through the consumption of the imported product by foreign tourists. But note too that we make many other concessions to foreign visitors because the cost of charging them would be a hassle. Tourists are given free coverage for minimal accident treatment by ACC without paying premiums despite that a small ACC levy imposed at the border would be pretty straightforward. Any of these measures that slow down processing at the border and annoy tourists risk imposing cost rather in excess of the potential benefit. Returning residents are a bit different. Whether a Kiwi consumes alcohol or tobacco brought with them from abroad or bought at the local shoppes, the external costs are the same. A duty free limit then should be set simply in recognition of that it can be more expensive to collect taxes at the border from returning residents than to run those taxes within the country. There are perfectly legitimate, non tax avoidance reasons for bringing in product from abroad. When I go home to Canada, I like to bring back ice wine that's otherwise here hard to get. Smokers may wish to find products that are different from those commonly available here. We also have a personal goods concession allowing the import of goods valued up to $700. This gives us a bit of a benchmark on Customs' expected hassle-cost of collecting taxes at the border. If it isn't worth hassling an incoming returning resident for $100 in GST because of collection costs, it would be surprising if it were worth hassling an incoming returning resident for $67 in excise. Presumably the import allowances are set with a recognition of that returning residents will often have a combination of personal goods, tobacco and alcohol. The threshold for imposing hassles at the border is then pretty high, because hassle costs at the border are pretty high. Where Edwards has a reasonable point is that as excise increases, the duty-free allowance should presumably change. The higher is excise, the lower should be the duty-free allowance because it will be easier to hit the break-even point where excise matches the transaction cost of collecting it. I've not seen the time path on the personal concession for tobacco product. If it isn't lower now than it was a decade ago, there could be grounds for checking whether it should go down a bit. But were the personal limit to be lowered substantially, we'd need a separate and higher limit for incoming tourists. And that too imposes hassle costs. Finally, it isn't hard to imagine second-best arguments where, if consumption among higher income cohorts is less likely to impose substantial external harm - they tend to have private health insurance, for starters - then duty-free imports for jet-setters is one way of having excise rates that scale appropriately. In other news, the NBR reports that changes are afoot for low-value GST exemptions on imports. I really hope that whatever regime they come up with recognizes the potentially large fixed cost imposed on any import when you make online shoppers go through an extra hassle step to collect the goods they're buying. It would be very very easy for regulations here to turn into protectionism for local inefficient retailers. The worst is yet to come for Christchurch housing. 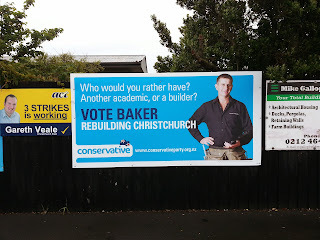 As the rebuild picks up, we're going to have to house thousands* more construction workers, families in temporary housing while their houses are being repaired or replaced, and somehow find room for incoming students as fear-of-Christchurch eases. The Christchurch City Council and the Canterbury Earthquake Recovery Authority (Cera) have pledged to work together to tackle the city's housing problems. Both organisations are promising more action to address the shortfall of housing in the city amid growing concerns the housing pinch, which has already pushed rents and house prices sky-high, will worsen between now and 2017. "I would like to think this is a new start . . . that we can work together. There is so much at stake," council housing committee chairman Cr Glenn Livingstone said yesterday. His comments came during a workshop on housing organised by the council and attended by representatives of Cera and the Ministry of Business, Innovation and Employment (MBIE). MBIE senior analyst Dan Martin told councillors the loss of about 12,200 homes in the quakes had dramatically changed both the rental and home ownership market in the city. It was estimated 7 per cent of the housing stock had been lost. The housing situation in Christchurch is now the worst it has ever been, forcing some families to squat in empty red zone houses. People being forced out of rental accommodation because of earthquake repairs can now not afford alternative accommodation, welfare agencies say. Mr Gorman said squatting in red-zoned houses was not unusual for the homeless - but he was now aware of families who were moving into abandoned houses. Mr Gorman said a mother with two teenagers was squatting in a Bexley red-zoned house because they could not afford to rent a home. They been previously been in a rented property but had to leave that for earthquake repairs and couldn't find anywhere else affordable. Absolutely none of this is surprising. Many people have been very loudly suggesting that Council needed to open things up so that new housing could quickly come on-stream. Very simple fixes, like allowing people to put in a secondary flat inside their houses, could have been achieved at a penstroke a thousand days ago. And yet Council did nothing. Instead, we've had years of arguing about zoning and plans and building codes and stadiums and light rail. I understand the standard public choice arguments around NIMBY regulations and housing. Long story short, homeowners like higher prices and hate having lower income neighbours and so push for regulations that keep minimum lot sizes large, prevent densification, and restrict development out to the suburbs. Similarly, property-owning developers want strong restrictions on the ability to develop - the regulations then enforce something of a cartel among those developers who can work the system. Sure, it's all couched in a nice veneer, but those are the basic incentives. Groves and Helland show that zoning is mostly a distributive enterprise: a way of allocating rents. Clingermayer similarly provides evidence of zoning's being used both as a way of reducing externalities and as a way of distributing rents. Evans despairs that urban planning takes pretty much no account of standard cost-benefit analysis and instead operates under a public choice model which, while helpful in understanding why things are as they are, does little to help us understand how to fix things. "Thus the economist who chooses his profession in the hope of advancing human welfare, and then chooses to study the economics of town planning, is likely to find his or her professional career frustrating, since their advice will be either ignored or unpopular." Webster summarises the basic approaches: Pigovean, Coasean, and Public Choice. Pennington's book looks especially helpful; I need to order a copy. His paper here highlights planning failures and the cycle in which policy failures beget further failures. What I don't understand is why the basic economic theory of deregulation didn't kick in. Peltzman taught us that when the costs of regulation change, the equilibrium changes. All of the minor niggling regulations that propped up housing prices and increased building costs in Christchurch before the earthquakes became incredibly binding and restrictive and costly after the earthquakes. Why didn't Council get out of the way? I can understand worries about the long term and what the city should look like fifty years out. But very simple things that would have had little to no effect on long term character and that could have quickly brought at least some more supply onto the market immediately after the quake were also blocked. Why did it take more than a thousand days to get to the point where Council starts taking seriously that we might just need to let people build more houses more easily? Why did it take the threat of central government imposing a plan? Understanding why Christchurch screwed up so very badly might help in fixing Wellington's regulatory structures before their earthquakes come. Rent-seeking and political capture by homeowners, each of whom likes the idea of housing affordability in general, but particularly likes their own asset value increasing and dislikes their neighbour's attempt at subdividing. Legal risk to Councils where any easing up on building codes could expose them to "leaky-home" style liability. And while this can explain stuff around construction methods and dithering interminably over setting the building codes post-quake, it does nothing to explain council reticence to open up more land or to allow increased densification. RMA litigation risk: failing to allow increased density or to permit more development on the fringes causes homelessness; fixing the regulations might lead to somebody suing them for not having gotten all the processes right or not having consulted sufficiently or for failing to have properly considered amenity affects. Council fears of taking on infrastructure costs. However, MUDs do solve that problem rather nicely. More psychological explanations: a disfunctional council (elected and/or bureaucrats) post quake just wants to hunker down and do exactly the same thing it's always done in exactly the same way it's always done it. Allow people to put flats into their houses? Bah, we've never allowed that. You just want to turn the area around the University into something like Dunedin, don't you? Well, we won't have that, not in our city. You say we're expecting another fifteen thousand construction workers? Well, [sticks fingers in ears, shouts la-la-la-la-la I can't hear you]. I haven't any great answers here but it's something worth thinking more about. * One estimate that was floating around was 15,000 additional workers in the next year. I agree entirely with Alex Tabarrok's post on the ridiculousness of the FDA's shutting-down 23 and Me. Further, I would love to subscribe to a service like 23 And Me. But I haven't yet. We've recently found out that the NSA has basically been able to see everything that Google sees. And Google knows just about everything about me. I have zero worries about Google knowing everything about me - they just use it to better target ads, and I see that as a plus rather than a minus. They might turn ads from a nuisance to offers to sell me things I'd actually value at more than their selling price? Oh Nos! But having that big database of everything just sitting there is way too tempting for government. What they can't subpoena from it, they'll hack their way into and steal. Things that seemed kinda crazy conspiracy theory territory just a couple years ago... well, priors get updated. 23 and Me, run by Anne Wojcicki, Sergei Brin's partner, is putting together a great big database of everybody's DNA. Sure, for now, they've not run the full analysis along all base-pairs, just key markers. But we'll get there as costs drop. Eventually they'll have a great big searchable database of millions of people's DNA. And it will be great, just like Google is great. We'll find out all kinds of associations between genotype and phenotype we'd never otherwise have known about. Rare diseases will get spotted early, lives will be saved. Maybe we'll even get some kind of merger with Google profiles to make it even more accurate. And the ads I get will be even better (again, I see as a plus). But a database like that is awfully tempting, isn't it? The first temptation will be searches for matches against samples from crime scenes. Even identifying the close kin of criminals can help pin them down. And it will be popular. Because finding and stopping criminals is popular. So warrants asking 23 and Me if they have any matches for particular samples will go down a treat. Then we'll start seeing 23 and Me elevated risk profiles for criminal activity. Parents will want to know if their kids are at higher risk for antisociality in their teenaged years, so we'll see these start showing up in their profiles. And my won't those profiles be tempting. And we know that Google's been way less vigilant against designing things to harden against government attacks. Where that's normally irrelevant, it's pretty hard to believe that we'd have that different a culture in a company run by Brin's wife. If a service like 23 and Me started up in China, I'd likely sign up. I cannot imagine the Chinese government giving two whits about the genetic profile of individuals in New Zealand, or their being at all likely to respond positively to subpoenas from America or elsewhere asking to trawl through their databases. And they at least try to keep the NSA out of their stuff. Transactions costs to New Zealand kept us from signing up to 23 and Me a few years ago. For once, I'm kinda glad about those kinds of costs. * I suggested a bet with Bryan Caplan on this stuff on Twitter. He reckoned 1% chance; I'd thrown up a 10% ballpark. We've settled on 5%, but need to flesh out the details. I'd expect something like "If, by 2025, mainstream media reports that government agencies are using DNA database profiling to find groups more likely to commit crimes, and uses the information to target social assistance or criminal justice agencies for crime prevention, Bryan owes Eric $20. Otherwise, Eric owes Bryan $1. If the FDA mess effectively closes down 23 and Me (substantial drops in subscriber base), bet's off: it's a conditional bet." I'd be happy to go to one chance in four that 23 and Me is served a warrant asking them to match crime scene samples against their database by 2025 as well. Driving after child in toilet training in back seat announces "I need to make a pee"
Note that post-quake Christchurch, with portaloos everywhere, was rather good on this front. Indulging a five-year old's preference to dungeon master me through a scenario he's inventing on the go and trying to keep track of the rule changes he keeps making. Checking the speedometer every 30 seconds on windy and hilly roads to make sure that you haven't varied by more than 4kph from the speed limit. People with latent toxiplasmosis (from cats) have 2.65 times the baseline risk of car accident. That's the average. For those with high levels of toxiplasmosis antibodies, the risk is 16 times higher. People with high levels of toxiplasmosis are worse than people driving above .08. See also here. Some of the evidence on risks associated with having a cold, though I haven't the time today to calculate odds ratios from their presented data. See also here. A blog post last week offered an unexpected idea: New Ph.D.s are behaving like those who seek to join drug gangs. "If you take into account the risk of being shot by rival gangs, ending up in jail or being beaten up by your own hierarchy, you might wonder why anybody would work for such a low wage and at such dreadful working conditions instead of seeking employment at McDonald's. Yet, gangs have no real difficulty in recruiting new members. The reason for this is that the prospect of future wealth, rather than current income and working conditions, is the main driver for people to stay in the business: low-level drug sellers forgo current income for (uncertain) future wealth. Rank-and-file members are ready to face this risk to try to make it to the top, where life is good and money is flowing," wrote Alexandre Afonso, a lecturer in political economy at King's College London. He cites the work of the economist Steven Levitt and the sociologist Sudhir Venkatesh in understanding drug gangs. "With a constant supply of new low-level drug sellers entering the market and ready to be exploited, drug lords can become increasingly rich without needing to distribute their wealth towards the bottom," he writes. "You have an expanding mass of rank-and-file 'outsiders' ready to forgo income for future wealth, and a small core of 'insiders' securing incomes largely at the expense of the mass. We can call it a winner-take-all market. Then he turns to academe and finds very similar conditions. "The academic job market is structured in many respects like a drug gang, with an expanding mass of outsiders and a shrinking core of insiders. Even if the probability that you might get shot in academia is relatively small (unless you mark student papers very harshly), one can observe similar dynamics," he writes. "Academia is only a somewhat extreme example of this trend, but it affects labor markets virtually everywhere.... Academic systems more or less everywhere rely at least to some extent on the existence of a supply of 'outsiders' ready to forgo wages and employment security in exchange for the prospect of uncertain security, prestige, freedom and reasonably high salaries that tenured positions entail." ... reality is a bit more Weird Al. 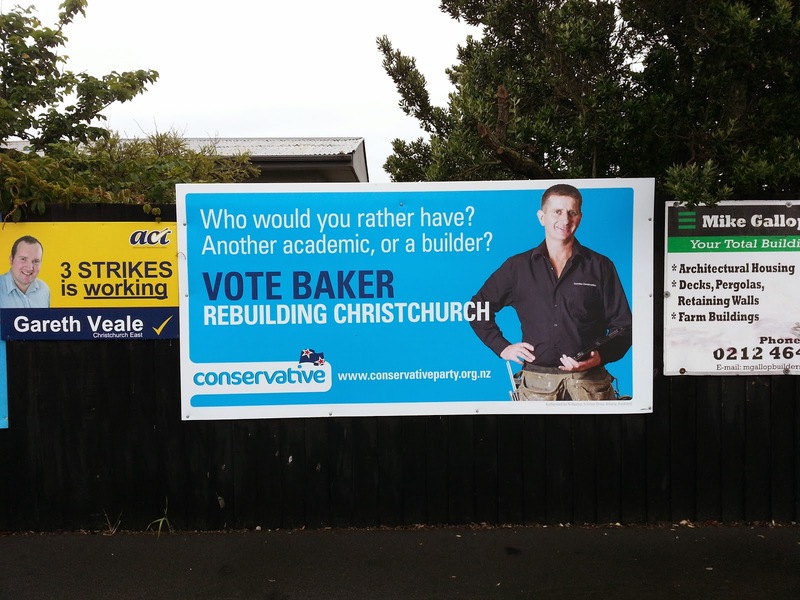 I'm not quite sure what to make of this election billboard in Christchurch East. Baker, Leighton. Conservatives. A builder. Doocey, Matthew. National. Healthcare manager at the CDHB. His website notes a BSc (Hons), MA, and an MSc. It also says he's studying towards a doctorate in health by distance at Bath University in the UK. Gaskin, Ian. Independent. Who knows. But he wants to go into coalition with Key. Holland, Adam. Independent. Who knows. I don't think he's an academic. Lambert, Paula. Aotearoa Legalise Cannabis Party. Described as "Christchurch East mother Paula Lambert", no occupational or education details listed. Nice policy statement - maybe she has an academic background, but it's hard to say. Lichtwark, Jenner. Democrats for Social Credit. Mystery fiction writer. Moorhouse, David. Greens. Canterbury BCom in Accounting, works in IT. Park, Sam. Independent. Who knows. I don't think he's an academic. Veale, Gareth. ACT. Earthquake claims specialist, recent graduate in Politics at Canterbury. Matthew Doocey comes closest to being an academic as he's working towards getting a doctorate while working as a CDHB manager. But it would be a pretty big stretch to call him an academic. [Update: same holds for Poto, see above.] Unless anybody with book learning (as opposed to Book learning) counts. iPredict says National has a 24% chance of winning the by-election; Williams has a 76% chance. None of the minor party candidates, according to the betting markets, have any chance of taking the seats. We then should read most of their positioning as building the party vote for the next general election. The Conservatives are placing themselves as the party for those who disdain academics. There's probably a reasonable market there. But boy would it be sad if we ever traded a party on the right that grounded itself in Hayek and Friedman for one that seems more likely to send the academics out to join the shearing gangs. Update: James Dann comments here, noting other billboards contrasting, effectively, trades versus suits. That's at least a totally fair comparison for Christchurch East. And pro-trades would, and should, resonate really well in Christchurch. "Just let the tradesmen start building and get the darned suits out of the way" - not nuts at all. Their identity politics play isn't a bad one. But the anti-academic flavour puts me off. Update2: Alternative reading: this is all just part of the trades/suits framing, with anybody who doesn't work with his or her hands being counted as an academic. Not quite the standard definition, but not an unpopular one. One potential explanation for lower female wages: employers fear that female employees will take maternity leave and condition wage and employment offers on that risk. I'm not saying it's a good thing. It's almost certainly illegal. But it's potentially a thing employers do. My Masters student Hayden Skilling is currently investigating whether this can explain any substantial part of the unexplained gender wage gap; I'll report on results later this year. In the meantime, here's an interesting bit of evidence. Spending a lot of time in casual employment rather than full-time employment increases the risk that a woman is childless by age 35. MAIN RESULTS AND THE ROLE OF CHANCE The likelihood of childbirth by around age 35 was reduced for every year spent in casual employment, irrespective of socioeconomic status, partner's education and parents' birthplace. The likelihood was reduced by 8, 23 and 35% for 1, 3 and 5 years spent in casual employment, respectively. Now run the thing in reverse and assume rational expectations. You're an employer. Two equally capable potential employees are up for a job. One comes with a non-trivial risk of taking maternity leave. The other is male. In case of maternity leave, you need to sort out cover and you can't guarantee that the employee returns. So you're taking on risk and you need to be compensated for taking on that risk. There exists no real way for young women credibly to signal that they have no plans on having children, or that they promise to work for n years prior to any childbearing. It's generally illegal for the employer to ask, and both the candidate and the employer knows that any promise made is unenforceable - in fact, the employer would likely get in trouble for trying to enforce it. Again, I'm not saying any of the resulting equilibrium is in any way good or desirable. If you wish to promote gender equity, though, you have to set incentives such that good results obtain. Maternity leave mandates that are costly to employers will likely result in fewer women being given positions that draw maternity coverage. Employment subsidies proportionate to the cost of the risk imposed might socialise the costs more efficiently. Previously: Parental Leave and Benefits. Perhaps this isn't as crazy as Foreign Policy suggests. An unusual Dutch initiative aims to put an end to one of Amsterdam's worst nuisances -- those bawdy, loitering alcoholics -- by employing them in a kind of street cleaning corps. The problem, though, is that the state-financed Rainbow Foundation behind the project pays the self-professed chronic alcoholics in beer for their labor. "The aim is to keep them occupied, to get them doing something so they no longer cause trouble at the park," Gerrie Holterman, who heads the Rainbow Foundation, told AFP, referring to Amsterdam's Oosterpark, an apparent favorite haunt of the alcoholics. And at least some of the participants agree on the apparent benefits of the initiative. One man in the program named Frank told AFP, "Lots of us haven't had any structure in our lives for years, we just don't know what it is, and so this is good for us." But by offering positive reinforcement to Amsterdam alocholics' worst tendencies, the weirdly commonsense solution to the problem of drunks causing a ruckus in public parks raises some serious ethical questions. The two groups of about ten people work three days a week cleaning city streets and are paid ten euros a day for their labor, along with a half-packet of rolling tobacco and five cans of beer. The men start the day off with two cans, have another two at lunch, and finish off with a last can in the afternoon. Did being an alcoholic ever pay so well? I don't know, but would be willing to bet, that most of these workers were consuming rather more than the equivalent of five cans of beer per day before they started in. The delivery is paced throughout the day so there's no chance any of them get drunk. By delivering the beer as beer rather than as the cash equivalent encourages pacing things rather than having the workers spend it all on lower cost per unit binge at the end of the day. The FP piece turns pretty snide about the initiative, saying it's enabling alcoholism. Looks a lot more like harm-minimisation to me. Just over a thousand days ago, the February 2011 quakes hit Christchurch. On the agenda for tomorrow's Christchurch City Council meeting are a suite of measures allowing for housing density intensification in response to the anticipated supply pinch to hit over the next couple of years. presented was undertaken as well as more detailed work on rules and mapping of relevant areas. In mid September, a package of proposals was sent to CERA representatives following review by Council and since that time dialogue has been maintained to help refine the proposals. 3.9 Feedback from CERA officials indicated that the proposals developed by the Council did not go far enough in tackling housing supply issues. This was outlined to Councillors in the Ministerial briefing on 30 October. This report outlines the agreed Council position, and highlights areas of compromise. Reconfiguration/conversion of an existing residential unit into two units. Enabling two residential units on a vacant site. Enabling use of existing family flats as a second residential unit. Extending and relaxing provisions relating to elderly persons housing. Council in October supported family flats only in L1 zonings; their revised recommendation is to allow it throughout L1, L2, L3, and Hills Zones. Conversion of large homes to two units is supported, but subject to controls over space standards and parking. Appendix 2b suggests that the parking controls could be used to restrict whether you could add more parking spaces or driving accessways onto an existing section rather than to mandate their provision. I hope that this is the case because minimum on-site parking mandates could be used as part of a NIMBY push against their neighbours' intensification. It looks like Council is recommending that all this be done, with the regs yet to be written. Those wanting to ensure affordable housing come onstream would do well to watch how binding these regulations wind up being. There are some promising-sounding moves to let developers apply for a "floating zone" consent for more intensive development of larger land sections. And, owners of L1 and L2 sections needing to rebuild will be allowed to put two houses on the section rather than just one - also a great move. But it has taken over 1000 days for Christchurch City Council to finally come to the view that, in the middle of a giant housing mess after a giant earthquake, they might just want to stop banning people from putting secondary units into their homes. OVER ONE THOUSAND DAYS. I expect that the combination of CERA and the Crown-appointed consents manager shouting at Council planners, combined with a new and competent Mayor in Lianne Dalziel, has had a lot to do with the change. But that it took all this to get Council to stop banning people from building secondary suites into their homes, in the middle of a post earthquake housing crisis... well, it doesn't do much for my faith in government. Thank you, CERA. I despair that it's taken this long. But thank you. Update: Thursday's Council meeting seems to have been a debacle, with a paperwork snafu pushing things back to the next meeting. Gerry Brownlee was reportedly (and understandably) livid. Councilor Glenn Livingstone was perplexed about Brownlee's frustration. I suppose, after a thousand days, what's another week? People play up the scary numbers. None of these will be news to loyal readers, but will be news to many Radio Live listeners. I hope more Radio Live listeners flip over to Stats Chat. A couple weeks ago, Matt Nippert and I had a bit of fun imagining a Rob Ford sitcom that could follow after the current Toronto Mayoralty reaches its inevitable end. Here was our pitch. The episodes Matt suggested have his handle. #TheTwoRobs: the sitcom starring post-Mayor Rob Ford and Rob Schneider as post-divorce apt roommates. Me and @MattNippert sorted Season 1. #TheTwoRobs S1E1 (@MattNippert ): Establish premise: "What oddball antics will Ford get up to in this week's drunken stupor"? #TheTwoRobs S1E2 Ford screws up in hiring a hitman to deal to his enemies; Schneider left to sort out the mess. #TheTwoRobs "@MattNippert: S1EP3 Ford drunk-dials brothel, but it's roommate Schneider - moonlighting as gigalo - who turns up at his door"
#TheTwoRobs S1E4 is a crossover episode with Always Sunny in Philadelphia to try to boost ratings. And would be awesome. "@MattNippert: S1E5 #TheTwoRobs save money by cooking their own crack, but burn down apartment after forgetting to turn oven off." #TheTwoRobs S1E5 Perfect Strangers homage "When You're Cooking Up The Crack". &(via @MattNippert) incompetent fly swot slapstick interlude. S2E1 #TheTwoRobs try tackling addictions by seeing counselor Charlie Sheen. Episode ends with trio partying with Chappelle's Tyrone Biggums. Kiwis need to adjust their expectations of Canadians. I'm not 'somewhat rude for a Canadian'; I'm 'remarkably polite and well-adjusted, given his heritage.' Please revise accordingly. More seriously, here's Andrew Coyne, who rightly assesses that it's time for Ford to go. While there are certain advantages to having all the other mayors scared that your mayor might beat them up, Toronto's well past the Laffer-max on that kind of metric. The weekend Press included a feature on binge drinking and price mechanisms. But does making something more expensive deter excessive drinking? Professor Tim Stockwell, of Canada's University of Victoria, published a paper last year, drawing on 20 years of alcohol sales data. It showed the shock of raised liquor prices dampened sales significantly. The conservative estimate was that, for every 10 per cent rise in prices, there was a 3.4 per cent drop in consumption, Stockwell said. "Alcohol is like all commodities - prices go up and consumption goes down, all else being equal." However, opponents of the idea, such as Lion, say it is not enough for minimum pricing merely to decrease consumption. It also had to make a difference to the big problem of binge drinking. A report by Eric Crampton, an economist at the University of Canterbury, concluded that pricing policies were not effective enough to be worth introducing. It said there was definite evidence that problem drinkers reduced their consumption when prices rose sharply, but the effect was more marked on moderate drinkers. A 10 per cent price rise saw moderate drinkers cut their consumption by 4.4 per cent, against 2.8 per cent among heavy drinkers. An Auckland University of Technology study, reported in its magazine Insight, also says that price rises as high as 25 per cent had little effect on buying behaviour among students sampled in both Australia and New Zealand. I don't think I've written any reports on this topic, but I have written many posts citing the Wagenaar metastudy from which the numbers above come. The Press piece here is rather good. They cite the defensible number from Tim Stockwell rather than the version Jennie Connor cited last year. They use Australian household surveys from 2001, 2004 and 2007 to see how changes in alcohol prices affect the number of reported days of no, low, moderate, and high alcohol consumption; they find that while price increases do reduce consumption, they tend to reduce the number of days of low consumption while not changing the number of days of moderate and high alcohol consumption. This would be consistent with binge drinkers dropping the occasional beer or wine with dinner to save up for the big nights out. If policy is more worried about binge drinking than about light drinking, this might matter. I've pretty weak priors about AgResearch's restructuring. The government's looking to move some of the work currently done at Invermay up to Lincoln. Dunedin Council and the Otago Regional Council don't like the plan, as expected: whether or not the proposal does net overall good, it's not good for Otago. Dunedin and Otago commissioned BERL to analyse the business case. I've searched around online for it and haven't been able to find it. It's not in the Dunedin Council press release. I can't see it on the BERL site. A Google site search of BERL for "AgResearch" doesn't turn it up. Similarly, searches for BERL and AgResearch only turn up newspaper reporting on it. So I've not been able to read the piece or evaluate it. A spokesman for Mr Joyce responded to questions about the report by hitting out at the quality and independence of Berl. ''The minister stresses he hasn't had the opportunity to read the report but was interested in comments about robustness because in his experience in the five years he has been a minister he has had concerns about the robustness of some of Berl's analysis. ''It's also difficult to describe Berl as 'independent' because again, in the minister's experience, they tend to write reports which uncritically support the views of those who commission them,'' the spokesman said. The way the report had been presented and comments from Mr Cull suggested the report was ''another part of an ongoing campaign to influence the outcome of AgResearch's deliberations''. Mr Joyce last night stood by his comments, adding that in his experience Berl was an advocate for ''preserving the way things were, regardless of the real economics of changing circumstances''. Mr Joyce's original criticisms came after Berl - which was contracted by the Dunedin City Council and the Otago Regional Council - questioned AgResearch's case for restructuring and slashing about 80 jobs at Invermay. Mr Joyce through a spokesman told the Otago Daily Times on Friday - despite not having by then having read the report - that he had previously had concerns about the robustness of some of Berl's analysis work and that it was difficult to describe Berl as independent because it tended ''to write reports which uncritically support the views of those who commission them''. Berl executive director and chief economist Ganesh Nana on Saturday said he was ''disappointed and saddened'' by Mr Joyce's comments. ''We ... totally dispute the assertion that we are not independent or that we write reports to clients' order,'' Dr Nana said. ''That's something that we don't do, but if we did do that we wouldn't have lasted 55 years,'' Dr Nana said. He also took issue with the minister questioning the quality of Berl's work. Berl had a good reputation and he stood by the findings in the report. I don't discount that BERL could be right this time. There's been some reporting that prior internal AgResearch documents supported strengthening Invermay. But I'm not sure that Joyce is wrong; instead he seems to be Bayesian. Consider the prior history here. Auckland and Bay of Plenty wanted somebody else to pay for fast broadband rollout. BERL reported that dairy production in the Bay of Plenty would receive a boost equivalent to seven percent of the export value of the region's dairy product. They also reckoned the Auckland region's GDP in 2025 to be about $1000 per capita higher if broadband rolled out in 2012 instead of 2015. Neither seems at all plausible. The Rail & Maritime Transport Union and City of Dunedin wanted to show how great it would be for the country if KiwiRail were directed to ignore profitability and do all its rolling stock construction in Dunedin. BERL told them that the government would wind up being $65-70 million net to the good. Again, pretty implausible. Or, if you buy that case, why don't we pay Holden to run its car manufacturing in New Zealand? The subsidies they're getting in Oz are starting to seem a bit unsustainable. Maybe it'd work here. Labour and the Greens wanted to show that their NZPower plan would be great. BERL told them that the economy would get a $450m annual boost, so long as we assume an economy with deficient demand such that there are unemployed resources that can be drawn into production without opportunity cost. If you find the right set of starting assumptions, you can come up with the right answer. Question is whether that's the set of starting assumptions that best models reality over the requisite period of analysis, or the set that tells the folks commissioning the study what they want to hear. BERL told NZ First that the biggest cost of dropping inflation targeting would be the loss of face for "mainstream" economists. Maybe there's a case for NGDP targeting over inflation targeting, though I'm not convinced of it in a small open economy. But that wasn't what NZ First was going for. The Canterbury DHB wanted to know just how terrible alcohol is. So BERL told them, after assuming, at footnote 14, that there were zero savings from moderate alcohol use: they specifically set equal to zero the coefficients in their source aetiological table for conditions where alcohol reduced costs rather than increasing them. They also did this in their earlier report on the social costs of alcohol for MoH and ACC, more fully critiqued here. The Greens wanted to know just how awful asset sales are. So BERL told them just how costly it would be. Assume that revenues from sales go towards building other assets that will provide an equivalent dividend yield but that time-to-build means a few years' delay in getting the new stream. Surprise surprise, selling the assets is terrible. See comment above about choosing one's assumptions. It isn't hard to look over the track record and come to a position like Minister Joyce's. I've no urge to go hunting elephants and so I wouldn't pay any positive price to kill one. I'd probably pay some positive price to avoid having to kill one. But it's good that some folks have a willingness to pay to do it. Why? It can help fund conservation efforts. Elephants are endangered. But some local herds can be beyond their range's capacity to support the population. Active herd management then is needed. If you're going to have to cull some animals, why not get somebody who'd be willing to pay $40,000 or more to do it, and put the funds towards conservation efforts? I don't know what kind of safari tour GoDaddy founder Bob Parsons was on, but I really really doubt that high profile folks make a habit of going on illegal safaris and then posing for pictures. Feeling Good, Doing Harm. Again. Meanwhile, the US is destroying a big stockpile of seized elephant ivory. Brendan Moyle would like some evidence that doing so does more good than harm. Many open-access resources, such as elephants, are used to produce storable goods. Anticipated future scarcity of these resources will increase current prices and poaching. This implies that, for given initial conditions, there may be rational expectations equilibria leading to both extinction and survival. The cheapest way for governments to eliminate extinction equilibria may be to commit to tough antipoaching measures if the population falls below a threshold. For governments without credibility, the cheapest way to eliminate extinction equilibria may be to accumulate a sufficient stockpile of the storable good and threaten to sell it should the population fall. That emphasis is added. Sell it, not destroy. The (gated) AER version of the paper is here. The Montclair State version is here. A few comments and responses are here. In other words, our government is pursuing symbolic value but at the same time implementing the wrong incentives. Previously: Eat them to keep them. * You could build a second best case for the shaming's being efficient if policy around the conservation areas were messed up and they were killing too many animals and if the gains in the interval until policy were fixed outweighed the costs after policy were fixed and the hunters continued staying away. Tyler Cowen notes some of the potential ambiguity in inflation incidence. Where SMBC suggested that inflation is particularly bad for strippers, who tend to be paid in $1 notes, Cowen noted that this is only a medium-term effect: at some point, customers will round up to either the $2 or the $5 note. Mileage may vary by more than Tyler suggested. Suppose a customer wants to tip $5. If it's hard to tell from a distance whether an American note is a $1, $2, $5 or $10, customers would tend to prefer holding up five one-dollar notes to one five-dollar note. The former is clearly $5 while the latter isn't. I think Tyler's results require that the dancer is able to judge the denomination from a distance. That will work in Canada, New Zealand, or other countries that make it really easy to tell which note is which with brightly coloured notes, but not so much in the US. This doesn't run contrary to Tyler's suggestion about inflation incidence, but where SMBC's primary concern was dancers being burdened with too many low-value bills, I think that continues to hold in the US. @EricCrampton in the real world, strip clubs issue their own fake "tipping dollars" to customers, who can redeem unused ones when they go. @EricCrampton there's no reason tipping dollars couldn't be worth $1.50 or even $1.17 and continuously adjusted. @EricCrampton note: while customers redeem at full value the strippers often only get 80% or 60% or whatever. That's how the club gets paid. @BruceHoult @EricCrampton Inflation-adjusted stripperbux could gain cachet as legit currency. I doubt that this would work. While Canadian Tire money did circulate, it's not like your partner would give you trouble for finding Canadian Tire money in your wallet while fishing around there for cash because she outsources all the bank machine cash-getting to you. Stripper-bucks, on the other hand, well, I'd be reluctant to take them as change when getting groceries. Sam Wilson suggests sentimental attachment to the glamour of one's own currency might also militate against the switch to alternative inflation-indexed currencies. I doubt that inflation-adjusted notes are really that worthwhile in New Zealand, where RBNZ has been pretty decent at keeping inflation at 1-3%. Or anyplace where people hold low cash balances and accrue interest on bank balances, although with the caveat that taxing the inflation portion of nominal interest returns on same can distort things at higher inflation rates. David Farrar has a great summary of NZ's rather decent position in the TPP negotiations as revealed by Wikileaks. I can't see any spots where I'd disagree with what he's saying. But I'll add a bit. Farrar is certainly right that the NZ government could not have unilaterally released the text and that Labour politicians pretending otherwise are being disingenuous. New Zealand could have, and likely did, push within the treaty process for the text to be released periodically, but that kind of thing needs broad consensus. So while I'm glad that NZ didn't do something silly on this front, I'm also glad that somebody leaked the text. abuse of intellectual property rights by right holders or the resort to practices that unreasonably restrain trade or adversely affect the international transfer of technology; and (b) anticompetitive practices that may result from the abuse of intellectual property rights;, provided that such measures are consistent with this Agreement. The US wants copyright extension to 70 years, as Farrar notes. They also want retrospective protection of things that entered the public domain in countries like New Zealand where copyright expires 20 years earlier. That suggests that somebody should start archiving everything that has fallen into the public domain here before doing so is illegal, in case the US wins this part of the fight against everybody else. Maybe NZ wants Kim DotCom's house. The US and Australia opposed, and everybody else supported, limiting the liability facing ISPs whose networks were used in copyright infringement. [NZ/CA/SG/CL/MY propose: 1. Each Party may, in formulating or amending its laws and regulations, adopt measures necessary to protect public health and nutrition, and to promote the public interest in sectors of vital importance to its socio-economic and technological development, provided that such measures are consistent with the provisions of this Chapter. I expect this is to allow New Zealand to implement tobacco plain packaging regardless of what it does to the brand value for affected producers. The Fair Deal Coalition worries that parallel importation could be at risk. I didn't see it in a quick skim of the text, but I did only give the text a quick skim. A good deal is better than no deal. No deal is better than a bad deal. Whether the net winds up being worthwhile depends on where the negotiations go from here and what's in the other, unreleased, chapters. I can't really blame the journalists. They're effectively in the infotainment business. And if punters are more likely to buy newspapers with scary stories about genetically modified crops than newspapers taking the consensus of scientists that the GMOs that have made it through the regulatory approval processes have had a far more thorough going-over than ones that have used other mutagenic techniques, well, we can't really blame them too much. It can screw up policy though. There's a pretty serious externality through the political system where bogus scare stories whip up demand for regulatory regimes. Politicians cater to those demands. I've spent a fair bit of time at Offsetting hitting on this kind of theme around bogus studies of the social costs of alcohol that do much to inflame public sentiment against consumption but little to inform. Today's edition: GMOs. A paper in Cell Research last year suggested that bits of microRNA from food could migrate into people and so GMO bits could be dangerous. Canterbury biologist Jack Heinemann then put out a paper arguing, as I understand things, that if the Cell Research paper were right, then GMO wheat could also affect gene expression in people via the same mechanism. Most scientists working in the area thought this nonsense; the Science Media Centre put out a few rebuttals. Paul Gorman at the Christchurch Press covered the controversy, highlighting all the scary bits. Lax GM rules may bite back - scientists: the gene silencing mechanism (noted in Cell Research) could yield scary results in people, FSANZ needs to prove that it doesn't, etc. Greens challenge criticism of scientists over GM. Gorman paints it as scientists against Food Standards Australia-New Zealand, but lots of play for the Green Party's critique of FSANZ's competence. Scientists fall out over GM research. Gorman highlights accusations of bias on the part of the Science Media Centre, continues to portray FSANZ as incompetent. The Heinemann paper and the reporting on it have yielded some pressure on the government to take action. In contrast to these findings, the report on p. 965 finds no evidence for uptake of plant miRNA168a in the plasma and liver of mice fed a rice diet. Enzyme-linked immunosorbent assay data from the current study also contradict western blots from the Zhang paper that suggested miR168a directly suppressed levels of low-density lipoprotein receptor adapter protein 1 (LDLRAP1) in mice. Finally, the miRagen study suggests differences in diet composition, rather than miRNA-mediated cross-kingdom gene regulation, likely account for alterations in low-density lipoprotein in mouse plasma. We differ with this assessment and believe the paper is worthy of publication precisely because it is a negative result throwing light on a key research question. The original finding from Zhang and colleagues that plant miRNAs are capable of cross-kingdom gene regulation was an extraordinary claim. It went against a large body of research in which the systemic administration of double-stranded RNAs was shown incapable of triggering the RNA interference pathway in humans (and mice). It also raised concerns that plant miRNAs could pose health risks to humans. Indeed, last March, an article published in Environment International (55, 43–55, 2013) went so far as to claim that gene modification of plants using gene silencing mechanisms raises concerns for human health and that these concerns are not adequately considered in food safety assessments. This prompted the regulator Food Standards Australia New Zealand to undertake an assessment of the scientific literature on the issue and to publish a position statement on the regulation of genetically modified crops developed using gene silencing. Bottom line seems to be that FSANZ and the Science Media Centre were right, the Greens (again) were latching on to fringe findings that supported their priors, and the media ran a scare campaign. The whole Nature Biotechnology editorial is worth reading. They worry a lot about publication incentives and replication work. I continue to see no scientific basis for demands that GMO foods be labelled. It just feeds the panic. And I continue to update my priors on those who take the GMO fearmongering seriously. There are real social costs to feeding this kind of nonsense. Jenny McCarthy has much for which to answer; so too do the GMO-worriers. The Living Wage, in one chart.